Helmy Abouleish was born in Austria, came as teenager to Egypt, is married and has 4 grown-up daughters. He studied Business Administration, Marketing and Finance and has been Managing Director and Vice Chairman of the SEKEM Group for 16 years. He is (co-) founder of many organizations and has been or still is serving on 29 boards including the IFOAM Mediterranean and Anglophone African Group. Helmy Abouleish is a most competent and brilliant speaker and is therefore in high demand worldwide. Besides talking at the UN , FAO and UN DP he meets with world leaders and promotes the organic and sustainable agenda all around the world. Recently, he was invited to a presidential conference with US President Obama and a meeting with Prince Charles on sustainability and organic agriculture. Some years ago, Sekem has been recognized as “Outstanding Social Entrepreneur” by the Schwab Foundation in Davos and was awarded the Right Livelihood Award. Helmy Abouleish describes his personal mission: “To raise awareness for the urgency of a more sustainable development path in Egypt and around the world; to lobby for related policy changes, and to drive and support initiatives for sustainable development both in the public and private sector”. SEKEM was founded 33 years ago by Ibrahim Abouleish, Helmy’s father, as a small, bio-dynamic farm on the edge of the Sinai desert. Today, the farm totals more than 500 hectares. Every work day starts with a morning circle where the different work teams, companies and schools come together greeting each other and getting inspiration from a “text of the day” while holding hands. Until today, the bio-dynamic farm operation remains the backbone of SEKEM. One must see it to believe what a green paradise can grow on desert soil. The fields are lush green and a cornucopia of alley trees, flowers, birds and butterflies give you the feeling of being in a beautiful oasis. To create such a green miracle in a desert landscape is only possible with lots of compost that is produced in a huge compost plant where 40 people make fine compost out of animal manure, farm crop residues and hyacinths from the Nile River. The compost plant is also co-financed with carbon credits from the “Soil & More” initiative that was initiated by SEKEM. Typical for bio-dynamic agriculture is a dairy herd that is complemented by a flock of “fat tailed” sheep (a local breed), a chicken house as well as numerous bee hives. All of the animal feed for the farm is produced in SEKEM’s own mill. SEKEM employs 1,500 people in various companies, most of which are located on the farm grounds. 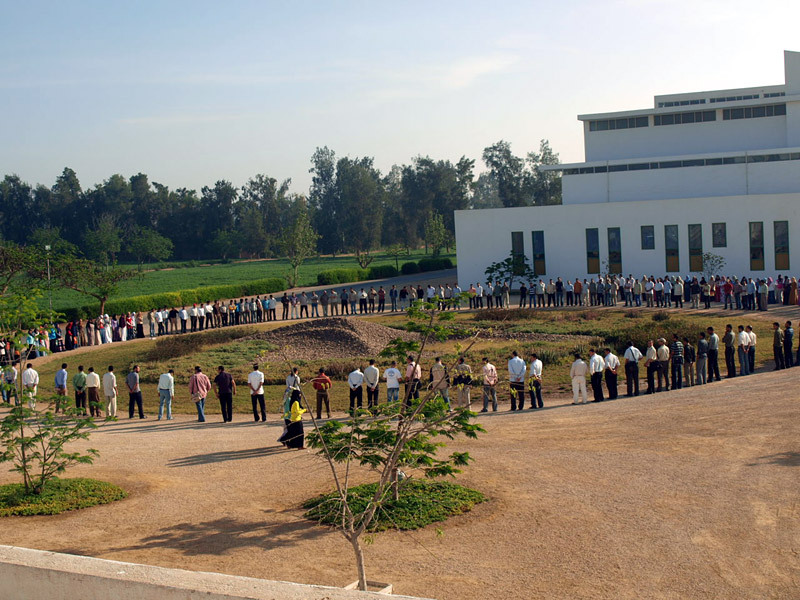 LOTUS produces medicinal herbs that are processed into teas which hold an unbelievable 70% of the Egyptian tea market. ISIS manufactures various organic food products. Fresh foods and vegetables are handled by a different enterprise called HATOR. The pharmaceutical company ATOS develops and produces natural medicines. LIBRA coordinates the cultivation of crops on the 1,200 bio-dynamic farms in Egypt, MIZAN produces organic seedlings and ECOTEC is a holding for facility management and sustainable industrial development. 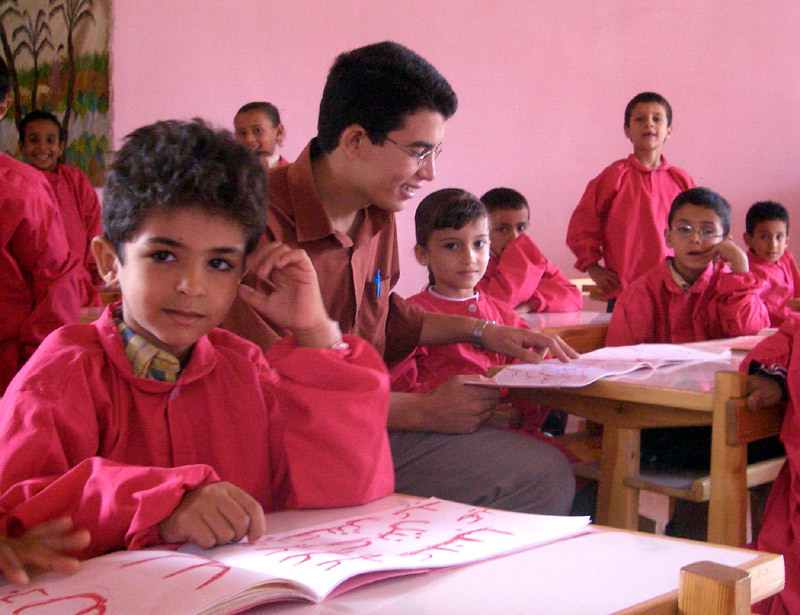 About 600 children are being educated in SEKEM in a Waldorf school and a kindergarten as well as in a Polytechnic School where young Egyptians get an education in metal-working professions, carpentry and electronics. SEKEM also maintains a school for handicapped people as well as a school for the so called “chamomile children”. In this school, 80 children from very poor families and school drop-outs are getting a chance for a good education. The pupils contribute to their education by doing some easy work tasks such as picking chamomile blossoms. The architecture of SEKEM village is very harmonious and features a circular guesthouse, an unusually designed mosque, a shop and a health clinic that is open for the SEKEM staff and about 30,000 people in neighboring villages. 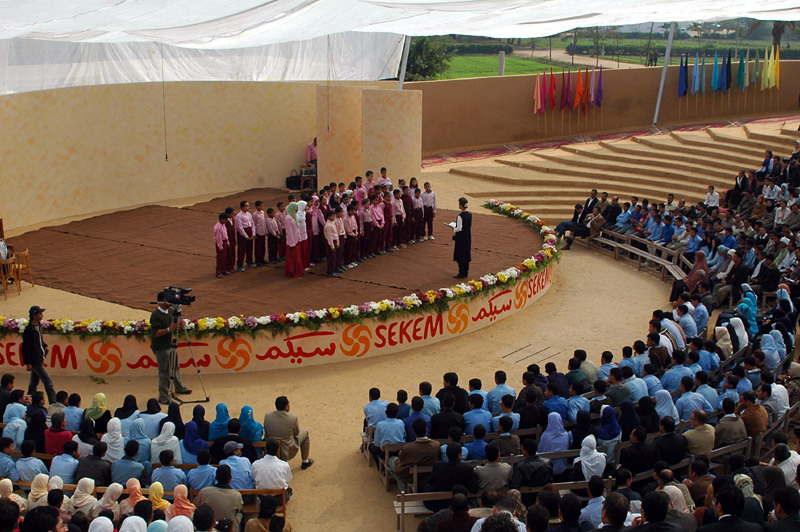 Eurythmie, theater, music (with the SEKEM orchestra) characterize the cultural life in SEKEM. SEKEM’s latest initiatives are a land reclamation project where three 2,000 hectare plots in the Sinai Desert are being converted into bio-dynamic fields and the HEL IOPOLIS University that is the major focus of the work of Ibrahim Abouleish. The university will open its gates next year and will include Organic Agriculture, Medicine, Pharmacy, Pedagogy and Arts faculties. SEKEM has set up a network of organic companies called Internation Association of Partnership in Trade and Ecology (IAP) and often takes the “driving seat” to advance organic issues. One example was their leading role in developing IFOAM’s ethical code for organic trade. Over the last 15 years, the SEKEM Group has become a very successful business based on an ecological and social enterprise approach which Ibrahim Abouleish refers to as “economy of love”. It has developed into what many consider the most successful and impressive bio-dynamic and organic project in the world.